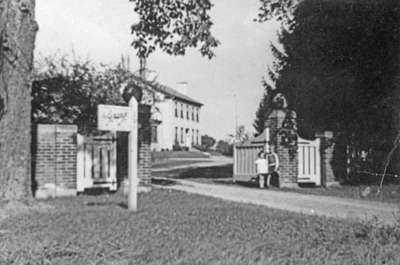 A black and white photograph of Carolyn and Charles Andrew Stuart Beecroft standing in front of the gates at the entrance driveway to "The Grange", residence of Frank L. Beecroft. This view is looking through the gates at the north-east corner of Mary and Pine Streets towards the house at 201 Pine Street. "The Grange", residence of Frank L. Beecroft, c.1947, Photographer Unknown. Whitby Archives 17-007-014.